A test of a new edition of my rules. Simple scenario based on an incident in the Peleponnesian War but I counted the sides as Syracusan and Athenian. An Athenian squadron is beached in a bay thinking they are safe. A Syracusan squadron comes up hoping to surprise them. The Athenians comprise three '2's, two '3's and a hemiolia. TheSyracusans have a pair of hemiolia accompanying one each of Dionysius' new '4's and '5's. All crews were rated as 'able' which equates to competent but nothing special. The 4 and 5 were relatively well manned with marines. As the Syracusans approached the Athenians were dicing for when they could see them and get away off the shore. This was not so good to begin with but a trireme got off on the 2nd move. The Syracusans had a setback on turn 3 when their FATE card caused the captain of a hemiolia to remember a sudden pressing appointment and leave for home. More Athenians pushed-off as the Syracusans sent their hemiolia off to the right to flank the enemy. The leading Athenian 3 now took a gamble. Speeding-up he tried to turn away from the oncoming heavies. The gamble failed and the Syracusan 5 slammed into his starboard beam even as he accelerated to escape. The 3 was immediately holed badly and the 5 pulled off as it was not necessary to board the stricken Athenian. The Syracusans had more luck when the hemiolia which dashed out to the flank managed to ram an Athenian 2 which was beached and still making ready for sea. But that was it for the Syracusans now more Athenians were at sea. 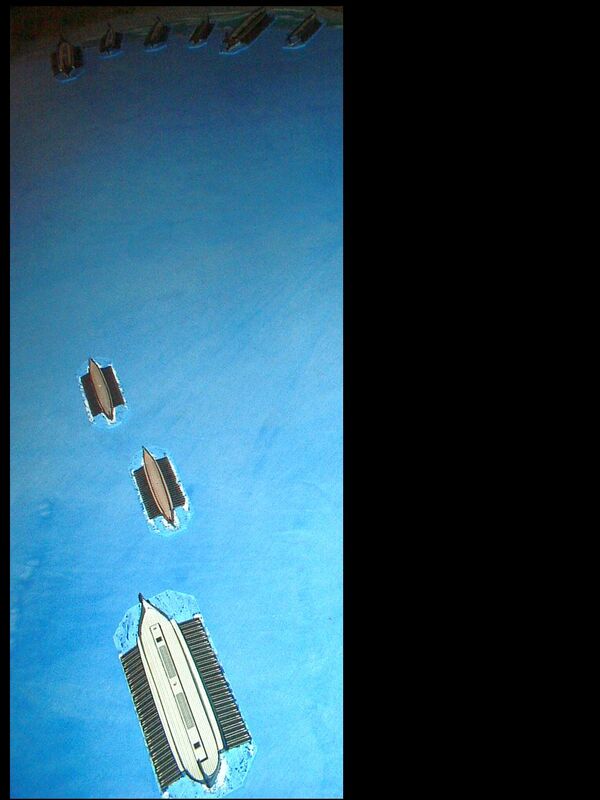 The 2s darted in and out at the larger ships and meanwhile the remaining Athenian 3 manouvered to ram. The holed 3 continued to sink, moving sluggishly. The Syracusan 4 was hit twice abeam by Athenian 2s and started to take on water. Not knowing which way to turn for the best it ended-up doing nothing after having rammed and holed the wallowing Athenian 3. The 5 had asome luck in outmanouvering one of the 2s. In one amusing episode a 2 swooped in to rake the oars off the 5's starboard side but the 2's crew failed to ship oars in time while the Syracusans did and the helmsman was forced to simply make a close pass of the 5. There were so many Syracusan marines and archers lining the rails of the 5 that by the time the 2 was passed its supposed prey the entire deck crew was dead. 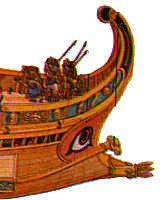 With half its oars shipped to avoid the raking attempt the Syracusan 5 was rammed amidships by the Athenian trireme at full speed. Even allowing for its greater size the 5 was severely damaged and settled in the water. The Athenian pulled-off and was at a safe distance before the massed troops on the Syracusan could do much damage. The end result was one Syracusan hemiolia safe on the horizon (but the captain probably due for execution) while his 3 comrades sank watched by relatively unscathed Athenian squadron, their main casualty being a trireme. A holed 2 made it to shore where it beached and the crew started work on repairs. Everything worked well. The Antikytheran Battle Computer worked and the FATE cards added colour and had some effect. I saw some need to simplify the deck crew rules for when larger numbers are present so that is something to work on. Boarding the enemy seems to have been a potential tactic at all times. 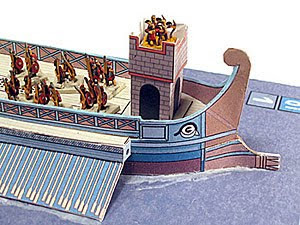 With the development of the ram came another option but it seems even when the ships were not usually heavily manned as at Salamis or in the Peleponnesian War or Athen's Sicilian adventure boarding was attempted. The question I ask myself is how did they get onto the other ship? At Salamis a Persian commander ends up in the drink after trying to board a Greek ship over the bow. Diodorus mentions beam-to-beam boarding - also happily commenting on failed attempts resulting in an early bath. The Roman raven was fitted at the bow so it was obviously normal for a ship to be in contact there from where the raven could be used and the raven was essentially a gangway. When a ship was beached gangplanks were used to get on and off. These came up either side of the stern. As here in a Roman fresco. The Greek's called this an apobathra. The Greek navy crew for Olympias could get a crew onboard and with oars out in 1 minute 30 seconds ! The question is was there some simple gangway or planking carried to help in boarding attempts? The 'normal' apobathra could be used for this at the other end of the ship, perhaps ? Or was boarding always an exptemporised affair done in an ad hoc manner during battle ? I doubt there was no provision made. The raven was seemingly discontinued because it may have contributed to instability - it was a solid construction. But ravens were meant for larger ships and triremes and smaller ships tried boarding actions. I cannot see an entire boarding party doing an Errol Flynn/Burt Lancaster and swinging across on ropes with daggers in their teeth because there was nowhere to swing the rope from ! My ancient galleys battlescape is now just about done. I made a headland, a bay and some rocks. All from flamingo painted with emulsion that has sand mixed-in. Basecloth made as outlined below. RAKE THEM FROM STEM TO STERN! We often associate this phrase with Napoleonic naval warfare. It refers to shooting cannon down the length of an enemy ship and thereby sending an iron ball plowing through a ship and its crew with the greatest chance of doing damage. 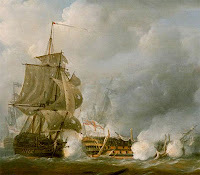 In the case of the Napoleonic ship under canon fire the results were truly horrendous but if one considers the density of men on an oared galley if it were subject to a similar missile attack the carnage could be on the same scale. In the cross-section of a Napoleonic ship are timbers of great thickness and only a limited chance of coming into contact with flesh for any missile traversing the length of the ship. When one looks at a trireme, for example, the chance of hitting a body is much greater and the chance of hitting heavy timber is less. 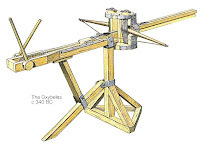 The development of torsion artillery is a Greek invention and was accelerated greatly by Demetrius 'City-Taker'. 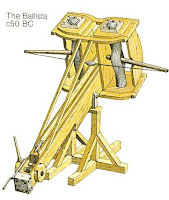 He had palintonoi which could shoot 80kilo balls 200m. To send bolts or stone balls flying from such engines into a wooden warship with only rawhide screen for protection must have caused chaos. If the oars are manned by single men each hit will disable several oars withthe knock -on effect of the loose oar on those around it. If the oars are manned by several rowers the chaos could perhaps be less but still considerable. Once palintonoi are mounted on ships they would be able to outshoot any ship without them. Bolts could be sent 400 yards maximum and certainly 200 with an accuracy and speed which would out-perform archers. Quick-firers - the polybolos -with a magazine were soon developed. Imagine you are on the deck crew of a trireme. There is not much cover because you are not meant to be in close contact with the enemy for long and marines were to prevent enemy coming aboard from the ship you just rammed. 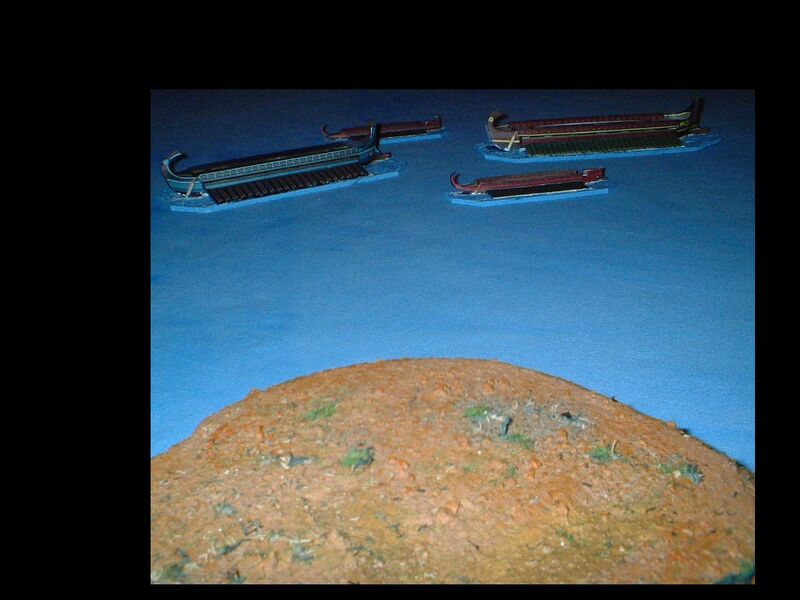 As your ship turns to ram a target which is 300 metres away the target trains a quick firing oxybeles on you. It takes a trireme 5-10 seconds to cover 30m. For up to two minutes bolts start flying the length of your deck every few seconds. You cannot reply. If you are an oarsman towards the prow you will be gritting your teeth as you start a ramming run because you expect a bolt or stone ball to crash into you any second. This kind of scenario changes the picture considerably from one where triremes circle and then dash in to sink their prey. Steam cannon would have been more deadly, with ranges up to 1km but there is no evidence they were ever mounted on ships. Larger palintonoi weighed in at 3 tonnes or so and threw 80kg balls. See one being built and shot here .They could not have been carried on any but the largest ship such as barges Demetrius City-taker used against Rhodes. However machines which could throw a 20kg stone 300 metres were much lighter and a bolt shooter could come down to 45kg in weight. Just accounting for one man's weight on a ship. It should be remarked that these machines are not the single-armed type like the later Roman onager but two-armed horizontal-motion machines. The embolon or 'spur' which we now call a ram became less significant in naval warfare. The use of an above-water spur -the proembolion - was adopted and this was meant to hold a target rather than sink it so a boarding action could be fought. If the days of the ramming action were over was it a result of the effectiveness of deck-mounted artillery ? At least in part. Heavier ships that were anyway less susceptible to ram attacks could mount artillery and make any opponents without heavy protection suffer badly when in range. The safest areas to attack from would be from directly ahead or from astern where only a single machine or none could be brought to bear. I am in the process of compiling figures for the power of the palintonoi and the strength of ship timbers. It seems apparent that engines could have changed the nature of sea battles dramatically or at least that advances in ship design which allowed their use did. Now its time for some land. With 1/300 scale there are some important considerations. 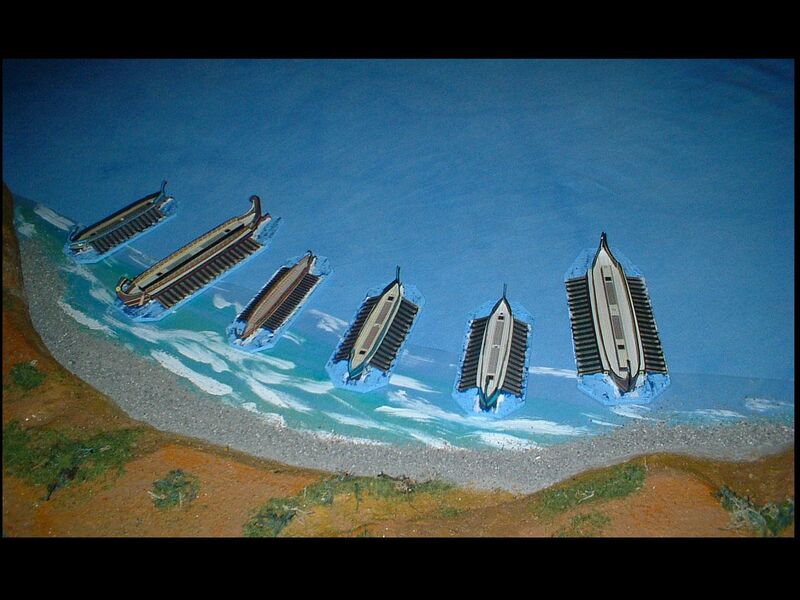 At this scale 3mm is one metre and any representation of a coastline should be to scale. It is too easy to create a bay or beach which looks ok on the table but is out of proportion. The bays at Arapis and Palouka where the Greek fleet was harboured before the battle of Salamis are each about a kilometre wide. The third bay, Ambelaki is the narrowest but is still more than 500m wide. 380 ships were divided between these bays. Earlier in the campaign a portion of Xerxes fleet 80 strong beached at Platania which has a beach c.1km long. The point here is that a bay or beach on the table must be of a realistic natural size. A kilometre is 3 metres on our ground scale ! If you look on a map of any coast and try to find a bay or beach less than 1km long you will probably also find one with dangerous rocks and currents around it and poor land access. Add to this the consideration of an ancient commander that he should not break his force into penny packets and we can see that it is not worth representing a small feature on the tabletop. If a beach is to be available for landing it would be a whole table side rather than anything 30cm or 50cm in size. Now, to get the broadest area for a fight on the table it is best to approach each other from diagonally oposite corners. This gave me the idea that it is easiest to make bays in the corners of the table then there is always a wider area to fight in off the beach. A bay 1m long is good enough and if the sides taper off the table then the feature takes up as little space as possible. This made me think about placing land areas on the game table. There is actually little justification for having land on the table. Any fighting will usually take place sufficiently far offshore to avoid shallows. A battle around a harbour is the only time to consider land as a significant part of the battle area, surely ? If land is to be available as a choice when setting a game up then it should perhaps only be on one side of the table. The channel at Salamis was an unusually tight place to fight in and it is more than a kilometre wide at its narrowest point. Not many gaming tables are 3m long ! A table-side of land is more likely to correspond to an island. Considering islands... there are not many islands in navigable areas less than 1km long. I had to hunt for these in the Aegean. It is rare to find small islands in an area where a battle might occur. If they are present they should be a minimum of 500m long. This equates to 1.5m or so and is closer to a table-side. Another land feature could be a headland or promontory sticking out into the battle area. The same considerations apply and the main thing is to have it of a significant size say, 50cm minimum. One type of terrain feature which is easier to deal with is 'rocks'. A group of rocks standing proud of the surface and marking a patch of shallow water is a nice tactical problem and should be available. Headlands represent areas resistant to erosion and rocks often stand close off headlands. Don't put rocks on the middle of a bay or randomly in the middle of the battle area. 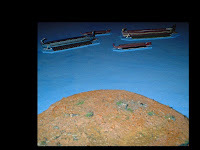 Shallows or sandbanks are not common in the Mediterranean except on the African coast where they are a major hazard to ancient ships and for this reason navigation routes ran well offshore. They are found in relation to bays where sandbanks sit offshore or where longshore drift builds some spits or bars. Sandbanks could be around off the mouth of a larger river or beside a harbour which has a mole or quay to promote sediment build up. But again - these features often occur where ships would not go and certainly would not fight.